Invisalign is fast becoming the preferred alternative to traditional braces. Whether you are an active and busy teen or adult professional, choosing to straighten your teeth with Invisalign is a non-invasive orthodontic solution that fits your lifestyle. For many years, traditional “brackets and wire” braces were the only option to treat misaligned teeth. However, traditional braces can be uncomfortable, unsightly, and inconvenient. Metal wires can poke and irritate the inside of your mouth, all while making brushing and flossing considerably more difficult. Many patients with metal braces find that they can no longer enjoy some of their favorite foods. Traditional braces can also affect your speech patterns and are impossible to miss because they stand out against the color of your natural teeth. Why Choose Robison Dental Group for Invisalign® Clear Braces? Fortunately, traditional metal braces are no longer the sole option for patients with mild to moderate dental misalignment. 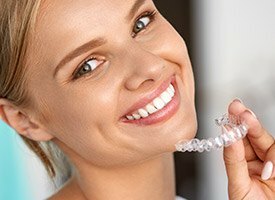 Invisalign offers a vastly preferable way to straighten teeth without the discomfort and inconvenience of brackets and wires. With Invisalign, your dentist first takes a mold of your complete dentition. The mold is then scanned, and a digital model is created. The model is used to create a series of individual plastic aligners; each aligner in the series is based on the stages of improved alignment between the current position of your teeth and your desired results. Invisalign aligners are made of a smooth, nearly invisible, state-of-the-art plastic. Most patients find that their aligners are hardly noticeable. They are comfortable and will not affect your speech because they are fully customized to fit your teeth perfectly. Invisalign is easily removable, making it simple to keep the aligners and your natural teeth clean by brushing and flossing regularly. Invisalign users are extremely happy with the treatment process. Appointments to change aligners mark the noticeable improvements in your teeth and progress toward your perfect smile. It’s a convenient process that’s possible to complete in as little as nine to ten months. Invisalign can be used to treat teeth that are gapped, crowded, or crooked. 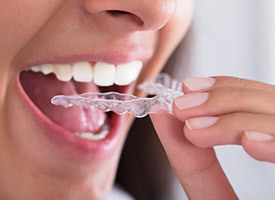 Invisalign can also correct overbites, underbites, crossbites, and open bites. The aligners also come with added functionality, including built-in wear indicators and up to six free replacements if you misplace an aligner. It’s clear why Invisalign is the best choice for countless orthodontic patients. Contact us today to schedule your Invisalign consultation with Dr. Robison at our Canton, MI dental practice, and discover the difference our patient-centric approach can make in your smile.